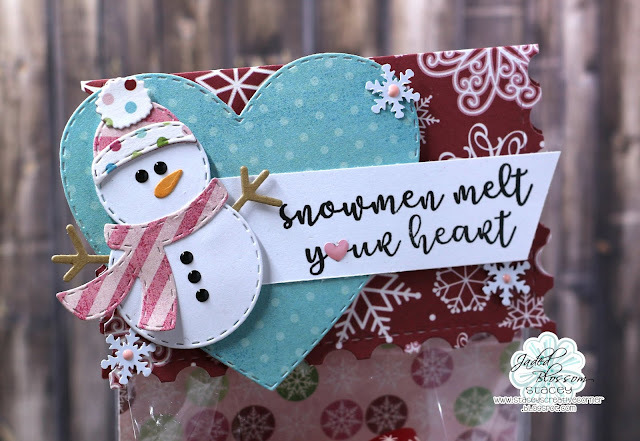 Stacey from Stacey's Creative Corner with you today sharing a cute little Christmas gift bag topper that I decorated using those awesome Jaded Blossom stamps and dies! I found these cute little Snowman ornaments at the store and thought they would be cute for some quick gifts. I added a bow to the top of the ornament and then placed it, along with some shred and patterned paper, into a gusseted bag. To create my topper, I used one of the Postage Dies , folded it in half and decorated it with the Heart Dies 2 and Snowman Dies & stamped my sentiment from the Winter Wishes (Revamped) set. I completed the look with a few snowflake sequins with some pink Nuvo Drop centers. I added a little enamel heart over the heart in the sentiment. 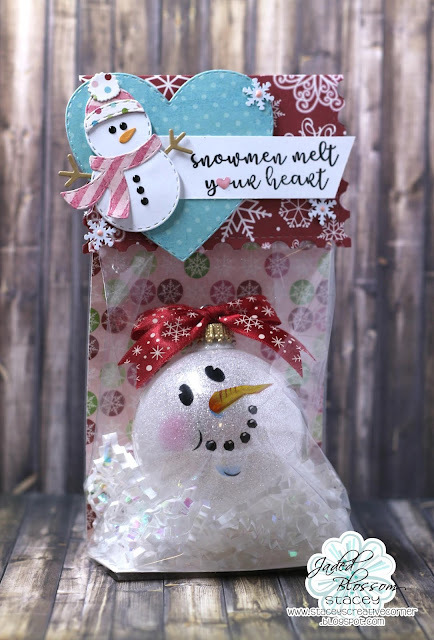 I think the little snowman on this topper is adorable and makes the perfect accompaniment to this little ornament gift. 1 down and a few more to go lol!! This is such a wonderful gift idea! LOVE your topper! Sooo cute!! Love your snowman topper!! Great gift!! !